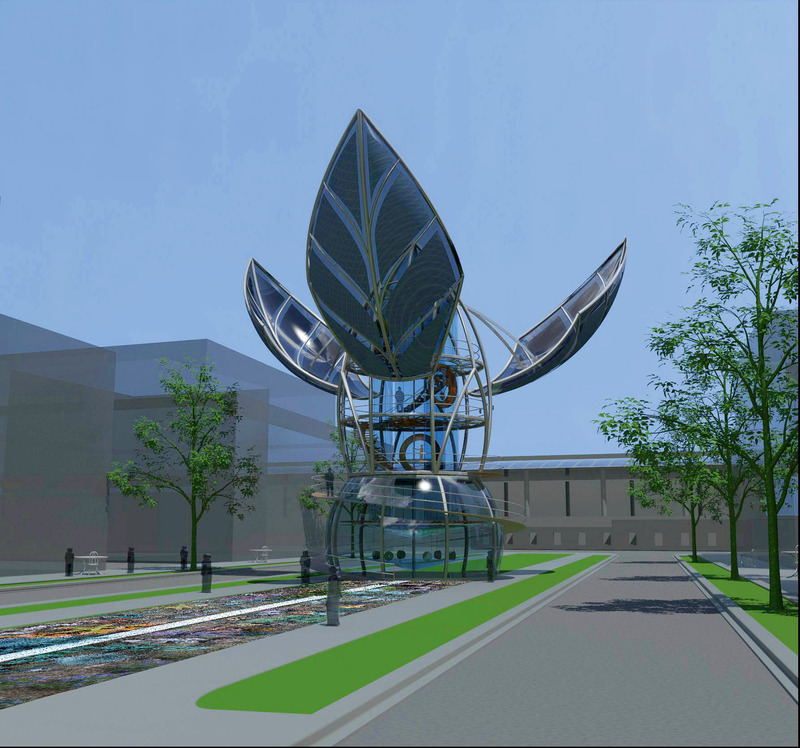 Organograph is a 75 foot tall kinetic sculpture proposed for public integration to the Diridon Station area in downtown San Jose, California where it will interact with the community and the environment for the next 100 years. Organograph is an ever-changing, participatory sculpture that invites the public to come inside it to observe, investigate and respond to the processes of climate change. It functions as a captivating civic beacon as well as a flexible instrument of scientific measurement, public education, and individual experience. The total mechanism of the sculpture responds to and provides a window into worldwide climate data. •Structure – The sculpture resembles a heliotropic flower (e.g. lotus flower), with large solar petals that open every morning and close every evening. The sculpture is entirely powered by the sun. In addition, the entire sculpture rotates once per day. Visitors can walk up inside the clock, and observe the mechanisms of timekeeping in action. •An accurate scale model representation of the global carbon cycle – All of the major sinks and sources of terrestrial and atmospheric carbon (specifically CO2) are represented in scale by flows of small carbon spheres within the sculpture. The flow of carbon between subterrainian (fossil fuels), surface (plants/animals), and atmospheric levels can be visualized and understood. CO2 in the earth’s carbon cycle that was existing prior to the industrial revolution (1900) is modeled in clear glass spheres. CO2 that humans have added to the atmosphere by the burning of fossil fuels is modeled in black spheres. The entire cycle is sped up 1000 times to display these slow changes in a rapid and understandable form. This simple model provides a clear mechanism for understanding of the complex system of the planet’s carbon cycle and how humans are affecting it through the burning of fossil fuels. •A moving climatic historical marker – The entire Organograph moves extremely slowly along a path (~ 1 meter/year). As it moves, it plants a garden of plants and flowers that marks the change in average global temperature on a grand scale. A new flower is planted every day. Taking a walk through the garden is like taking a walk through time, starting at the beginning of the industrial revolution through today. Our actions on earth dictate the organic park that is created in Organograph’s wake. A path winding through the middle of the garden is created by a time-accurate sample of carbon spheres from the carbon cycle mechanism, showing the mixture of pre-existing and human added CO2 in the atmosphere. The foundational education component of the Organograph concept is the Seeds to Plants program. Inside of the actual sculpture, hundreds of plants are arranged inside of the glass dome. Each of these plants has been independently seeded and nurtured by students and educators in an incubating pot. Each day a specific plant is selected by the Organograph’s climate monitoring systems to be planted at noon into the Time Trail Garden. Thereafter, that plant — permanently identified with a online linked History Tag — documents the climate event of that day. Together these plants form a historical garden which tells the earth’s evolving history of climate change. The students will have the opportunity to link their personal stories and reflections on climate change to the History Tag identifying the plant that they nurtured. In addition, the physical sculpture is accompanied by an online site accessible via History Tags where the public will have easy access to: learn about the climate change and the mechanisms driving it (and the Organograph), discover the interactions between individual actions and their climactic effects, and how to enjoy and encourage a carbon balanced existence, exchange ideas with other members in and outside of the local community.